The Basilica of Santa Croce in Gerusalemme stands at the slope of the Esquilino hill in Rome. It was built in 325 AD by Emperor Constantine to keep the holy relics found on the Calvary and brought to Rome by his mother Empress Helena. Over the last sixteen centuries of its life, the Basilica underwent various architectural reconstructions, hosting between its walls treasures of art, faith and culture. At present the Basilica, that is also a parish, looks after 1.700 souls of the roman suburban area of San Giovanni, San Lorenzo, Casilino, Panzanella. 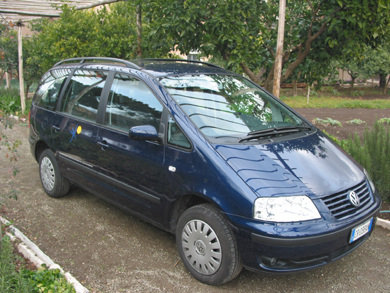 In the specific instance it takes over all the expenses of maintaining 21 very poor families of the above mentioned area, looks after the health conditions of a group of elderly people, paying the medical expenses, it pays the whole rent for ten elderly persons of the area, and it's a reference point for the evicted people. 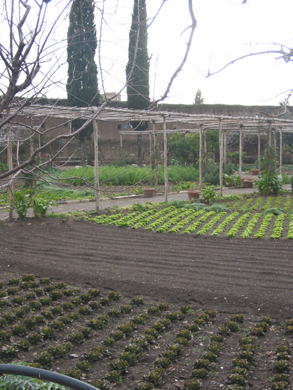 In the last months, thanks to private donations, the monastic community has realised a vegetable garden, with which it self sustains itself and provides free vegetables and fruit for the poor of the neighbourhood. 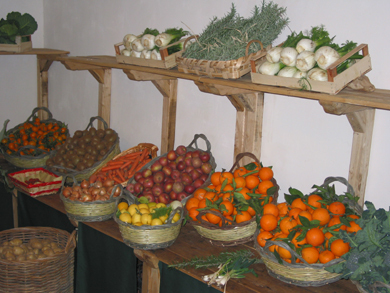 The vegetable garden is open to paying visitors and the income is reinvested in the activities of the vegetable garden. 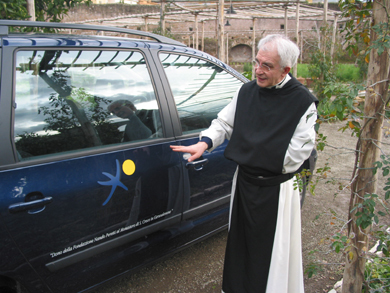 The donation of a minibus with eight seats like the one indicated in the estimate given by Volkswagen allows the young monks to carry out in the best way their duty of assistance in the above mentioned area. It allows transportation of products of the vegetable garden directly to the homes of the assisted people, often ill elderly people, and is a means of transportation for the elderly people that need to be accompanied to doctors. The Diocese of Rome is divided into five sectors. One central sector surrounded by the others which radiate out into the expansive suburbs surrounding the city. Our Parish of Santa Croce is the largest demographic parish of the Centeral sector of Rome and carries the burden of charity activities for a territory of the surrounding 16,000 inhabitants. Although the area is middle income there are many, especially elderly persons, in need of both limited and continuous assistance. Our response is to research means to sustain the effective works now in progress as well as assist the true and fundimental needs which come to our attention daily. The actual extensions of the Parish exist within the Esquilin zone bordered by and including the following streets: via Giolitti, via Casilina, via Acireale, viale Manzoni, via E. Filiberto, via La Spezia, P.zza di Porta Maggiore. With the types of charity assistance now in progress we seek to confront wisely the needs presented to us with specific intervention classified according to age, social economic divisions, and urgency. These situations are either determined or undetermined time periods effecting individuals and families. These activities are handled by a body of equipped persons under the gifted guidance of Fr. Simon Fioraso, Parish Priest and Monastery Prior. This group monitors the area interpreting and responding quietly and respectfully to the arising needs case by case. The collaboration with the Nando Peretti foundation will guarantee the solid and continual charity work that we have been privileged to provide during these past years. As residential development continues to augment our parish with new residents, (approx. 2,000 last year alone) we energetically continue to relieve and anticipate the distressing face of poverty for our neighbours in this "Capital" of the Christian faith, the eternal city of Rome. The organization Amici di Santa Croce, has worked to restore and construct many projects in the entire abbey and Basilica of Santa Croce in Gerusalemme. The Association is made up of noble families of Rome and has promoted research for sponsorship for the restoration of the apse of the Basilica and major oil paintings of great artistic value. 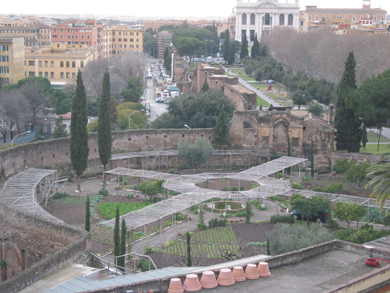 They have promoted the restoration of the antique monastic botanic and vegetable garden with great success, a project of the Architect Paulo Pejrone. - Painting and Arts activities for children, etc. The terrace represents for each of these activities a new, large and necessary space. The area will also be accessible to all those within the parish confines, designated as in the Esqiline zone, La Spezia, Giolitti, Casilina, etc. 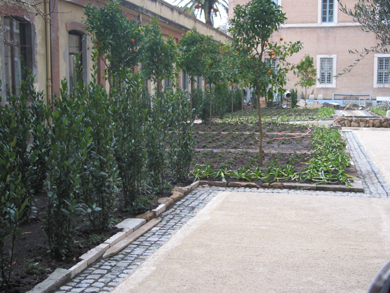 1) Restoration of the terrace over the garden, resurfacing of the tile pavement. 2) Residual payment for the parking area and garage roofs. 3) Residual payment for the monastic garden. 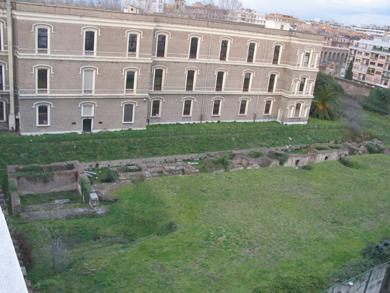 This allows a new access for parish residents to the section of Roman Wall known as the "Mura Aureliane", Amphitheatre Castrense and the only gardens in the entire "Esquiline Zone".